Memo, Chief of Staff, IRA, to Director of Publicity, Northern Command, 13th June 1942. This is an rare example of a surviving internal IRA memo from 1942. Sent from the department of the Chief of Staff, GHQ to the Director of Publicity, Northern Command on 13th June 1942. At the time, the Chief of Staff of the IRA was Hugh McAteer, while the Director of Publicity in the Northern Command was John Graham. The memo covers the IRA’s attitude towards American troops in the north following the entry of the US into the world war in 1941. In the IRA’s view, the stationing of any troops on Irish soil (British, German or American) could only happen with the consent of what was seen as the legitimate government of Ireland. According to the IRA, this was the IRA. While this may seem laughable, de Valera had taken a somewhat similar view of the deployment of American troops in Ireland. His constitution, enacted in 1937, retained the claim to authority over the whole of the island of Ireland and, as such, de Valera believed that the deployment of US troops in the north should only have happened following consultation with his government. As fanciful as this may all seem, there was a significant Irish-American lobby which could be mobilised. When the IRA Chief of Staff was detained in the United States at the behest of the British government in 1939, seventy-six members of Congress threatened to boycott an official event welcoming the British king on an official visit. After September 1939, there was pressure from Irish-America to make US aid for British war efforts conditional upon the British government addressing the issue of partition in Ireland. Indeed, the IRA had continuously positioned it’s own strategy with an eye on, at the very least, avoiding damage to de Valera and Fianna Fáil’s ascent to power in the 1920s and 1930s in the expectation that, once in power, they would seek to end partition and create an Irish republic along the line of the republic declared in 1916. By the late 1930s it was apparent that this was not going to be the case and, in the short term, the possibility of leveraging Irish-America towards the same end replaced the IRA’s long term hopes for de Valera. The IRA memo of 13th June 1942 was in the Director of Publicity’s Northern Command HQ when it was raided by the RUC on 10th September that year and, as it was used as a crown exhibit in the trial of Graham and David Fleming, it has survived in the Public Records Office. Odd Man Out: a story about the Belfast IRA? The film Odd Man Out was released in 1947. Based on Lawrie Green’s novel of the same name which had been published in 1945, Green also adapted it for the screenplay. The film was nominated for an Oscar as well as for the Venice Film Festival’s Golden Lion. It subsequently won a BAFTA award for Best Film in 1948. The novel sets the scene thus: “This story is told against a background of political unrest in a city of Northern Ireland. It is not concerned with the struggle between the law and an illegal organisation, but only with the conflict in the hearts of the people when they become unexpectedly involved.” While it does not specifically name the place as Belfast, it repeatedly references locations in the city. Similarly, the IRA is never openly named, but rather is referred to as ‘the Organisation’ (neatly mirroring the language of contemporary IRA volunteers who referred to it as ‘the Army’). Both the novel and the screen adaption are actually much richer in historical value than is usually appreciated. Cover of 1946 Book Club edition of the novel. The plot revolves around an escaped IRA leader who participates in a robbery that goes wrong. He kills a cashier in a struggle, is himself wounded and then accidentally left behind by his comrades. The story then plays out over the remainder of that day and night. Green wrote the novel between October 1943 when he finished On the Edge of the Sea and August 1944, when he produced a full typescript. His depiction of the circumstances in which the IRA found itself in 1943-44 and many of the scenes that play out in the novel are taken directly from contemporary events over the same time. Some slight shifts that take place between when Green wrote the novel and the adaptation for the film also mirror political developments between 1944 and 1947. To that extent, arguably the book and film are about the Belfast IRA to a much greater degree than Green’s own disclaimer, quoted above, suggests. The IRA leader Johnny, whose surname is ‘Murtah’ in the novel, and ‘McQueen’ when played by James Mason in the film, is referred to a number of times as the ‘Chief of Staff’ in the novel and is described as a recent escapee (about eight months before the events described). He is also described as having been given a lengthy sentence of sixteen years. After his escape he spends a long time hiding in one particular house, apparently in the lower Falls. While Johnny Murtah appears to be a composite of various IRA figures (including Rocky Burns and Jimmy Steele), the basis is clearly Hugh McAteer, the IRA Chief of Staff who had escaped from Crumlin Road in January 1943 and been recaptured in October 1943. The fact that the novel includes a Chief of Staff who is hiding out in Belfast is in itself revealing. The only times an IRA Chief of Staff was ordinarily resident in Belfast until the 1970s were in late 1942, most of 1943 and again, briefly in 1944-5. This was not necessarily public knowledge. The robbery that begins both the novel and film is also based on a real life incident, or rather, incidents. The setting is revealed in the novel as being close to Corporation Street, as that is in the district where Johnny first hides out. In January 1942 an IRA unit had robbed the payroll of the Civil Defence Headquarters in Academy Street, close to Corporation Street. During the robbery a clerk was wounded as was one of the IRA volunteers involved, Bob McMillen. In Odd Man Out, Johnny Murtah falls off the car used to escape, which didn’t happen to McMillen. However, it did happen to Louis Duffin after an attempted arms raid on a Newtownards Road RAF barracks earlier in 1943. Duffin was, literally, picked up the RUC (who thought the car had nearly knocked him down) and brought him to a nearby tram stop. If Green knew of this and used it as an element of the story, it too wasn’t widely known in 1945. More recently, while Green wrote Odd Man Out, another botched robbery at Clonard Mill in Odessa Street in October 1943, led to the death of an RUC constable. The setting, and fatality, are much closer to the robbery in Odd Man Out. Other scenes in the novel appear to echo actual incidents. In Odd Man Out, the rest of the unit involved in the robbery end up in the home of Teresa O’Brien, whose house was normally off-limits to the IRA as she wasn’t trusted. There are hints here of a widow, Mrs Teresa Wright, who lived in Quadrant Street. Shots had been fired at her house on 1st November 1937 and she said that there had been ill-feeling against her in the district and “…Several people had called me an informer when I was passing them on the street…”. The Teresa portrayed in the reporting of the incident is very similar to the Teresa who appears in the novel and film. Even the two older Protestant women who shelter Johnny Murtah for a while may reflect a reality as Hugh McAteer is known to have used a safe house off the Shankill Road in 1943 after his escape. 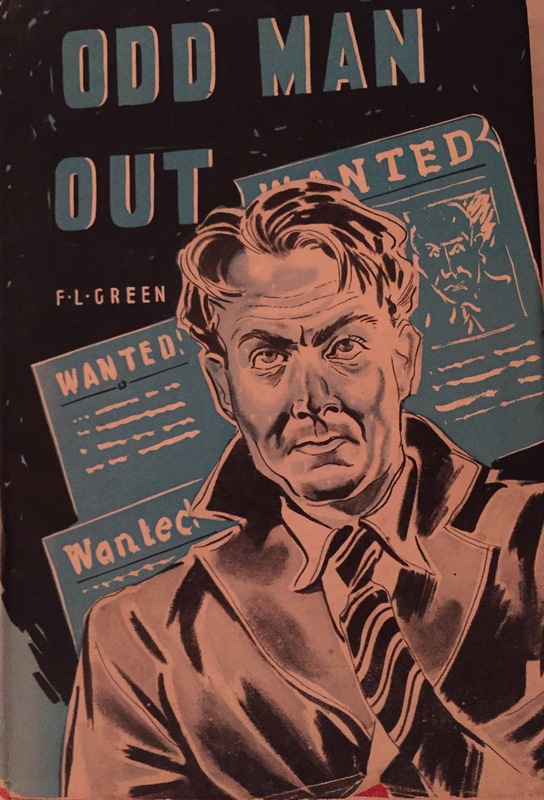 Despite not being in the public domain in 1944, as with the Louis Duffin story, it may have been that Green had heard these stories and so incorporated them into the fabric of Odd Man Out. Green’s depiction of an under pressure IRA in 1943-44 also appears quite accurate and he alludes to episodes of recent history in passing, such as the 1942 curfew, in a way that seems quite correct. How would Green have reproduced such details, particularly those elements not in the public domain? He had married Margaret Edwards, daughter of a senior tax inspector from Belfast and the couple had moved to to the city, living in Ulsterville Avenue. While there, Green regularly went to Campbells, a coffee house opposite City Hall. In ‘Culture, Northern Ireland, and the Second World War’, Guy Woodward records that a 1961 BBC documentary included former patrons who descibed Campbells as frequented by the likes of Green, William Conor, Joseph Tomelty (who appears in the film), Denis Ireland and Sam Hanna Bell. It was also remembered as a forum for political, literary and artistic debate in the 1930s and 1940s. This is equally evident in Green including caricatures of John Hewitt (Griffin) and John Luke (Lukey) in Odd Man Out. Hewitt, in particular, was irked at being heavily satirised by Green as Griffin: “There was hardly a platform he could prevent himself from taking, and from which he theorised in a robust, crisp, fashion…“. In reference to Odd Man Out, Green also reputedly chastised his contemporaries in the arts community in Belfast that “…I’m writing what you and your friends should be writing about, the drama’s that are going on here. You people are ignoring what is going on on your own doorstep.” (recorded by W.J. McCormack in his 2015 biography Northman: John Hewitt 1907-1987 – An Irish Writer, His World and His Times). Denis Ireland’s presence among the Campbell’s set is significant. Ireland had served as an officer in the First World War and had subsequently founded the ‘Ulster Union’ club, a republican debating group (which you would never guess from the name). A number of members of the Union had gone on to join the IRA, including John Graham, a key figure on McAteer’s IRA staff. Johnny Murtah’s deputy in the IRA may even be named ‘Denis’ as an homage to Denis Ireland while simultaneously alluding to John Graham. Repeatedly throughout the novel, as published in 1945, Green was very critical of the IRA and what he presents as the utter futility of its most recent campaign. This is very much toned down by 1947, in the film. In a very early scene, he has Johnny McQueen (James Mason) after much time thinking in his safe house, muse on whether the IRA would be better off pursing a political course: “…we could throw the guns away … make our cause in the parliaments instead of in the back streets.” This too reflects a certain amount of reality. According to Hugh McAteer, the IRA was privately debating the futility of its own campaign in the first half of 1943, largely in the safe houses in which he and Jimmy Steele were hiding. By the time the film was made, Denis Ireland himself was on his way to becoming a Clann na Poblachta nominee to the Seanad in 1948. Johnny McQueen’s speech about the parliaments directly reflects the thinking behind Clann na Poblachta, which was founded in July 1946 by ex-IRA Chief of Staff Sean McBride. This modification of the politics between the novel and film suggests that Green was concerned with the authenticity of his depiction of the IRA, which strengthens the argument that his work has considerable historical value. The issue of Republican News that was published just after Tom Williams‘ execution on 2nd September 1942, stated that “…neither the passions of the people, nor the fiery demand for action of the Volunteers, will make the Army authorities enter into hasty or unplanned action.” Just over a month after Williams’ execution, the IRA did enter into that ‘action’. At the start of October 1942 there was a sustained series of attacks by the IRA across Belfast (part of what is often inaccurately depicted as a ‘northern campaign‘). On the night of Tuesday 6th October, a bomb in Raglan Street injured three RUC constables, Tague, Hoey and Thompson, and two children, twelve-year-old John Langan and thirteen-year-old Sarah McCrest. On the Wednesday night, IRA volunteers threw a bomb on the Cullingtree Road, then detonated a second at the entrance to Cullingtree Road Barracks. A seventeen-year-old, Alexander Mawhinney from the Grosvenor Road happened to be passing and was injured in the side by splinters from the bomb. The next night, an RUC constable, Wilson, was shot and wounded when the IRA opened fire on an RUC patrol in the Cullingtree Road. The same night a bomb was thrown at an RUC patrol between Upper Library Street and Kent Street. The bomb fell behind an air raid shelter onto waste ground. The RUC then fired shots at the IRA volunteers who threw the bomb but no-one was injured. On the Friday afternoon Dawson Bates, as Minister of Home Affairs in the northern government, put part of the Falls Road under curfew from 8.30 pm to 6 am. The curfewed area extended on side along the Grosvenor Road from the junction with Durham Street to the Falls Road itself, from there down Divis Street as far as the Barrack Street junction, then along Barrack Street and Durham Street to the Grosvenor Road. The RUC continued to raid within the curfew area over the Friday night and Saturday morning detaining nine people. On the Friday night a bomb was thrown at Shankill Road RUC Barracks, outside the curfewed area. It shattered the windows in the polic station but caused no injuries. Area of the Falls Road put under curfew in 1942 (outlined in red). That night the IRA Chief of Staff, Hugh McAteer, had arranged to pay a visit to see if an old school friend, who was an RUC Constable, could be of any use to the IRA. Instead, the RUC Constable had informed his colleagues and McAteer and his Director of Intelligence, Gerard O’Reilly, were picked up by the RUC. McAteer felt particularly foolish at the circumstances of his arrest. On the Saturday night there were two further bomb attacks. In Raglan Street (inside the curfewed area) a bomb was thrown at an RUC patrol just as the curfew started. The blast broke some windows but there were no injuries. The RUC opened fire with revolvers at the IRA unit involved but did not manage to hit them or detain them. The predictable searches followed within the curfewed area and seven arrests were made. A couple of hours later an IRA unit threw a bomb at Donegall Pass RUC Barracks. The bomb fell short and detonated in the middle of the street shattering windows in the barracks and surrounding shops. Five people were injured, including three women, Ella Harrison, Victoria Wilson and Annie Clements, who were brought to hospital (although all were discharged the same evening). The crowd in adjoining Shaftesbury Square scattered as RUC Constables ran out of the Barracks and fired off shots. This alerted B Specials on patrol on Botanic Avenue. More shots were fired at the men who were believed to have thrown the bomb, as they ran up Botanic Avenue. But one passerby who saw the bomb exploding said he didn’t see anyone except the RUC fire shots and it isn’t entirely clear who was exchanging fire. Whoever fired the shots, two B Specials, James Lyons and Joseph Jackson, were seriously wounded. Jackson was shot in the side while Lyons was shot in the chest and died in hospital during the night. Accounts of the shooting in Irish Press 10th October and Sunday Independent 11th October 1942 contain eye-witness reports that suggests only the RUC opened fire. Nor do the issues of Republican News around that date and subsequent memoirs appear to make any claim that the IRA shot Lyons. The file on his inquest is still closed to the public (see PRONI, BELF/6/1/1/7/81). The next day, another attack appeared to have been foiled when Joe Campbell and Joe Quigley were arrested in possession of a primed Mills bomb near Legoneil Barracks. With Lyons death and McAteer’s arrest, the IRA attacks tapered off dramatically in Belfast. The RUC also made a series of arms finds in Ardoyne in the middle of October, capturing arms dumps in a house in Etna Drive, waste ground in Etna Drive, a nearby garage, waste ground in Belsheda Park and a house in Holmdene Gardens. A further dump was captured in Clyde Street (in Ballymacarret) at the end of October The IRA assumed an informer was at work, which may also have prompted it to close down operations. In mid-November, PJ Lawlor was charged with possession of grenade components and the hearing was held in camera, further increasing suspicion that someone was helping the RUC. On top of the mass arrests (and subsequent internments) that followed Williams’ execution in September, the northern government clearly anticipated making further raids. On Friday 16th October, two hundred and fifty internees were shipped off to the eighteenth century dungeon that was Derry Gaol (where there had been a prison riot in 1939). The loyalist bombing campaign also continued. On the night of Wednesday 28th October, a bomb was thrown at St. Brigid’s Parochial House in Derryvolgie Avenue. It struck the roof and rolled down onto the ground at the front door where it detonated. It damaged windows and doors and blew debris into the house. The two resident priests were inside but were unhurt. The bomb was a homemade canister. On the 30th October, the IRA carried out a number of further attacks in Belfast. A bomb was detonated outside the Harbour Police Station in Corporation Square, beneath a recruiting poster. The RUC fired shots after the IRA volunteers who planted the bomb but were unable to apprehend them. Separately, the RUC challenged two men in Herbert Street in Ardoyne. As the men ran off the RUC gave chase into a crowd outside a small shop. According to the RUC the men dropped a loaded revolver and Mills bomb as they ran. The Mills bomb exploded sending out a shower of splinters that wounded two RUC Constables (Davis and Carnduff), a 7-year-old boy, five teenagers and a woman. Two days after the Herbert Street explosion, a canister bomb was thrown over the wall of a factory that was being used as a British army billet but did no damage. In the raids that followed the two attacks, over seventy people were arrested and detained by the RUC. For several weeks, there were no further incidents, although the curfew remained in place. At the end of November, the IRA detonated another bomb, this time at the Talbot Street electrical substation. The bomb was similar to those thrown at RUC Barracks in October and went off at the base of a perimeter wall. The blast broke windows for fifty yards on either side of the sub-station. On the night of December 4th, a B Special called Thomas Armstrong confronted two men in College Street. After a brief confrontation with the men, Armstrong tried to come to grips with them. Instead one of the men broke away and drew a revolver, opening fire on Armstrong who was wounded twice in the back. This appears to be the same incident described by Harry White in his memoir, Harry. White and others on the Belfast staff then proceeded to court martial a Belfast staff officer over the finds made in October. More than anything else, the distraction of that court martial appears to have been responsible for the ending of IRA attacks in Belfast for some time. The northern government finally lifted the Falls Road curfew after 74 days on 22nd December 1942.